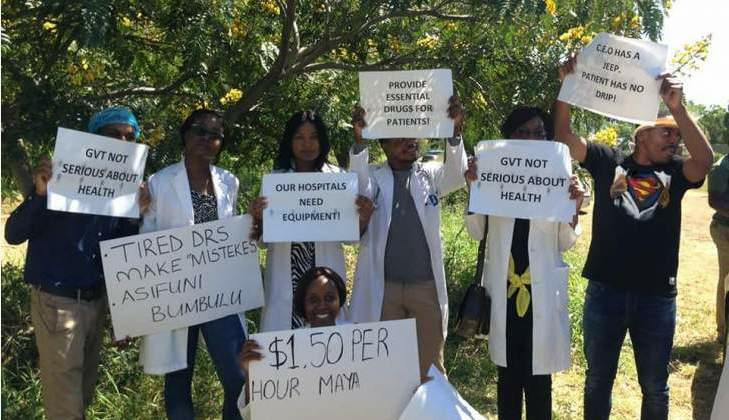 DENTISTS at Parirenyatwa Group of Hospitals have refused to participate in a countrywide strike by doctors at State institutions, saying they valued human lives more than money. The hospital's dental head, Hamadziripi Dube, said although doctors in his department were not immune to poverty and economic hardships which had pushed their peers into an industrial action, his department was open for business. "We have not joined the strike, we encourage patients to come here and we will give them a service because we are open, I have asked my peers here to show love for the people and their oath and we all agreed to continue to work. We say yes we want money but we must feel for our patients," he said. Speaking after receiving equipment donations worth $700 from 1980 Freedom Movement Party led by Francis Danha, Dube said this week his department would be offering free dental care in commemoration of the dental week which will run regardless of the strike. Danha pleaded with his striking colleagues to return to work and save lives while pursuing salary negotiations with government. "We call on doctors to unconditionally go back to work and in the event that they don't private doctors should volunteer to attend to patients at public hospitals even on Sundays. Doctors should urgently open avenues of dialogue and even action against government without compromising the patients' welfare," he said. He also urged the government to prioritise public health funding instead of pampering Cabinet ministers with luxuries.